For season after season of "Game of Thrones," several people in Westeros have been worried about a certain prophecy about the Prince That Was Promised, the mythical figure who will lead the world in the fight to defeat the White Walkers. Melisandre (Carice van Houten), the Red Woman, spent most of "Game of Thrones" telling Stannis Baratheon (Stephen Dillane) he was the Prince That Was Promised. Obviously, that wasn't true, since Stannis died. After that Melisandre thought it might be Jon Snow (Kit Harrington), since she managed to bring him back from the dead. But Missandei (Nathalie Emmanuel) added another wrinkle into the prophecy mix. In Episode 2, "Stormborn," of Season 7, Melisandre made her way to Dragonstone to meet up with Daenerys (Emilia Clarke), telling the queen about the prophecy. As she explained it in High Valyrian, however, translator extraordinaire Missandei noticed an error: The word for "prince" in Valyrian is actually gender-neutral, meaning the prophecy could be the Prince That Was Promised — or the Princess That Was Promised. Misunderstanding the prophecy has already cost some people quite a bit (including Stannis — his head, in fact), and the fact that it's vague means there's no person in Westeros who it clearly refers to. Fans have been doing their own translating of the prophecy, in fact, and that's led to some additional theories about who's really the Prince That Was Promised. As Reddit user byrd82 pointed out, several words in the prophecy could have been mistranslated, including the key terms "lord" and "light." In Valyrian, those words are extremely close to the words for "hand" and "gold." Though this is the first time the possibility of the prophecy being mistranslated has popped up on the show, the "A Song of Ice and Fire" novels on which the show is based have delved into that territory long ago. The most pointed example would be in "A Feast for Crows" when Sam Tarly talks to Maester Aemon about the rumors of Daenerys and her dragons in Essos. Aemon believed based on that info that Daenerys fits the prophecy, and that it had been mistranslated as "prince." Aemon tied the error not to the Valyrian word being non-gendered as Missandei says on the show, but rather that it should have said "princess" instead of "prince." There's also the thought that the prophecy isn't referring to a single person at all, an idea that is drawn from Dany's adventure in the House of the Undying in Qarth. The "A Clash of Kings" version of that event is a bit different from what we saw in season 2 of "Game of Thrones," they relevant difference here being a vision she saw of her dead brother Rhaegar in the book but not on the show. In the vision Rhaegar is with his wife, Elia Martell, and their baby son Aegon. Rhaegar says to Elia about their son: "He is the prince that was promised, and his is the song of ice and fire." Then, noticing Dany standing there, Rhaegar adds that "there must be one more" and also "the dragon has three heads." Some have taken that last bit to mean that the prince that was promised, also known as the reincarnation of the legendary hero Azor Ahai, is actually three separate people fighting for a single cause, possibly all Targaryens. We know Danenerys is a Targaryen, and that Jon Snow's real father was Rhaegar, making him fit that bill as well. Another big fan theory supposes that Tyrion is the third, via complicated theory that states that the Mad King is secretly his father (thus also being the real reason why Tywin hated him so much). 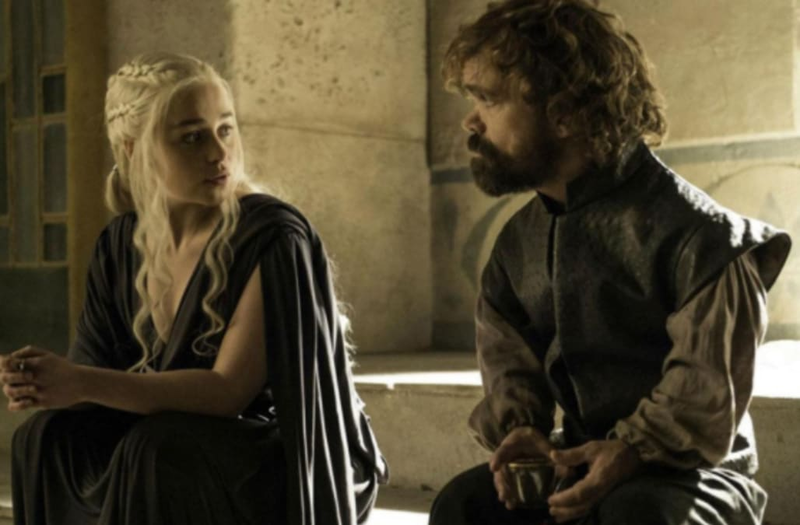 Even if those theories aren't on-point, it's clear from "Stormborn" that interpreting the prophecy is more art than science, and there are a lot of easy ways to screw it up. Maybe Melisandre should run the whole thing by Missandei just to be sure.